The mission of the Cincinnati Recreation Commission’s / Division of Therapeutic Recreation is to offer a continuum of leisure services for individuals with disabilities that promote healthy lifestyle as well as the opportunity to participate in high quality recreational and cultural experiences in the community. As advocates for individuals with disabilities we provide inclusive and therapeutic recreation programming choices and promote accessibility at all CRC facilities. In conjunction with the BlazeSports Club and many generous foundations, CRC has developed an accessible golf program that is one of the top in the nation. The heart of the accessible program is the six Solo Rider accessible golf carts that are housed regularly at our golf courses. The accessible golf carts can be used by individuals with any type of mobility impairment (they are not limited to wheelchair users). We also have adaptive golf clubs designed to be used from a seated positions and in some cases our golf professionals can adapt your current clubs to be used with the Solo Rider. The Solo Rider and clubs will be available for use at clinics and lessons, or can be available at the golf course you choose to play with prior request. Accessible clinics, individual golf lessons and instruction on using the Solo Rider cart are available throughout the golf season. 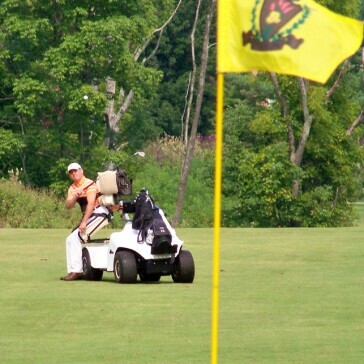 In 2009, the Cincinnati Recreation Commission (CRC) in collaboration with Hamilton County Parks District (HCPD) put on the first ever accessible/inclusive golf league concluding with a tournament. The league was composed of twosomes with at least one of the two players having a physical disability. There was a kick off meeting held on Saturday, May 30th at Reeves Golf Course for the accessible golf league to discuss the rules of the league and to meet the other teams. The partners played four rounds at both CRC and HCPD golf courses and posted one team score within each two-week period. The best three out of four scores were used to determine the league’s overall gross/net winners. The league’s final tournament and player appreciation awards/luncheon was held on August 8th after eight weeks of league play. The inaugural event was a great success and CRC and HCPD look forward to hosting the league on an annual basis. 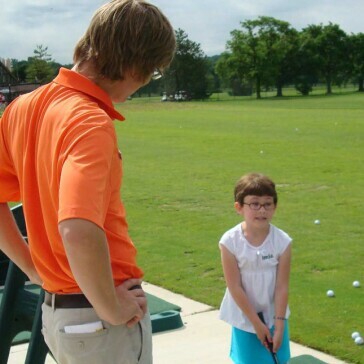 Each year, the CRC and Billy Casper Golf host two full day clinics, one geared toward those with physical disabilities, and one for those with cognitive disabilities. These clinics include instruction on the major components of the game (i.e. driving, irons, putting and chipping), followed by lunch and then actual play on the course. These clinics have been held the past six years, and receive positive feedback each year. In addition, weekly summer clinics have also been hosted for those with disabilities. Dates for these clinics are determined in the first quarter of each calendar year. 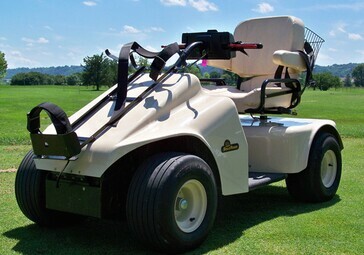 Unlike most carts, the Solo Rider cart is designed for only one golfer and may travel on any part of the golf course including tees and greens. The carts have hand controls, seats that can swivel 350 degrees and can rise to allow golfers to swing from a seated or standing position. The accessible golf carts can be used by individuals with any type of mobility impairment including those with limited to no trunk mobility. For additional information please visit their website. To set up an introductory Solo Rider demonstration, please call Micah Peavley, Billy Casper Golf, at 513.321.2740. We ask for notification at least 48 hours in advanced to reserve a Solo Rider, but it’s as easy as booking a tee time. The Solo Riders are available at the following CRC Golf Courses and will be put on reserve for you when you call to book your tee time. The Solo Rider will be staged in front of the clubhouse on the day of your tee time, or a staff member will gladly deliver it to you in the parking lot with a call upon arrival. Stopping by for a quick practice session or to play a round, we can provide accessible clubs and equipment to help you enjoy all of the facility’s amenities. Our fitting professionals have acquired specialized golf club heads and have installed ultra light golf shafts which meet the specifications needed for a golfer in a Solo Rider. The lie angles of the clubs are very flat relative to the standard club and promote better alignment at impact. Ultra light shafts with low kick points have been installed to promote higher launch angles and help to increase shot distances. The accessible clubs are also available for purchase and the fitting and personal customization is included with the purchase price. We also have a number of adaptive tools to assist you during your round or practice session. Our most popular pieces of equipment would be the Gravitee ROBOTEE. The ROBOTEE is an automatic golf ball dispenser that operates solely by the force of gravity. Operating the machine is simple. Once the self loading ball basket is placed onto the machine the first ball will be placed on the tee instantly and automatically. After the ball on the tee is hit off, the next ball will be dispensed on the tee without having to push any buttons. The unit also provides the user a synthetic turf mat to hit a shot from which simulates shots from the fairway. ROBOTEE units are housed at Neumann and Reeves golf courses, but may be transported to our other range facilities with a 48 hour advance reservation.